Street-Cleaning E-mail Notification System. Original concept and implementation. Parking Ticket Geek and I go way, way back to the Daily Illini in Champaign. We have started successful large enterprises together. But one thing we have agreed on more than anything else is the sorry state of affairs of Chicago's driver ticketing and revenue system. 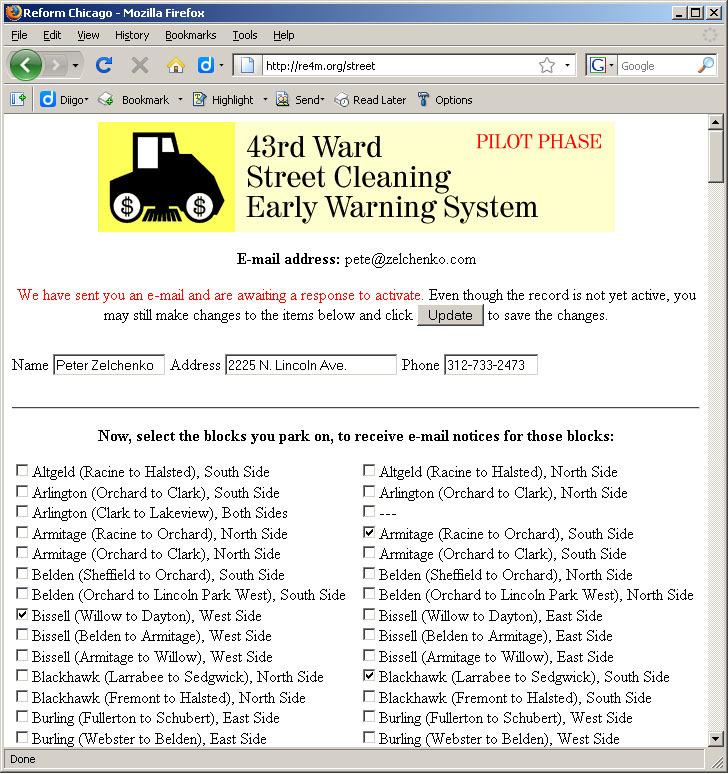 In 2006, in a very economically written PHP/PERL/cron package, I developed the city's first street-cleaning e-mail alert system. Within four months, I had over 2,000 users in the 43rd Ward alone. (Amazingly, whiz programmer and co-reformer Paul Miller released an almost identical product on almost the same date in the neighboring 32nd Ward. Great minds think alike.) Today, not to be outbranded, the aldermen of many wards in which this is a problem have implemented their own systems.